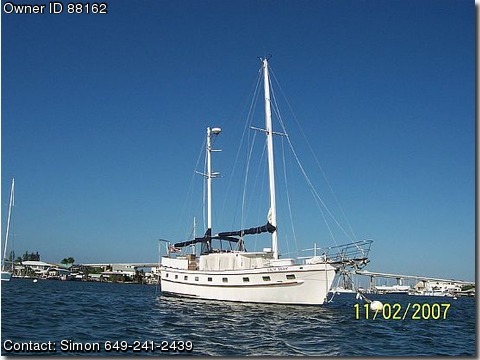 Superbly comfortable ocean going motor sailor, ideal live aboard with enormous usable living space including: aft deck complete with six easy chairs and captains chair, fold up table to dine six and occasional tables for day use, outside steering position; large salon with built in double sofa bed and one reclining lounge chair, mounted flat screen TV, pull out dining table, several storage cabinets, interior steering position, bookcase and open bar to galley. Fully equipped galley with brand new counter tops, new 11 cu ft fridge/freezer, new 4 burner propane hob and oven, micro wave and double stainless sink, storage cupboards, spice racks etc. Forward guest cabin with double berth, extensive storage and private bathroom with shower, tub, toilet and washbasin. HUGE master stateroom aft with walk round queen size bed, nightstands, 4 hanging lockers, drawers, built in desk/ vanity, ensuite bathroom with shower, tub, toilet and wash basin. 2 year old Garmin Chartplotter mounted upper steering, linked to 2 year old Garmin Radar. 2 small Furuno GPS 31 (one up, one down) as back up. VHF ICOM radio, fixed compasses (up and down), Robertson auto pilot. Ketch rigged with foresail, main and mizzen sails. Ford Lehman 120HP Model 135 diesel engine with dedicated 8D starter battery, approx 2000 hours. 2 x 225 gallon fuel tanks giving range approx 1250 nautical miles at 6 knots.